For more information about this event, please contact Go-Van at meetup@go-van.com. 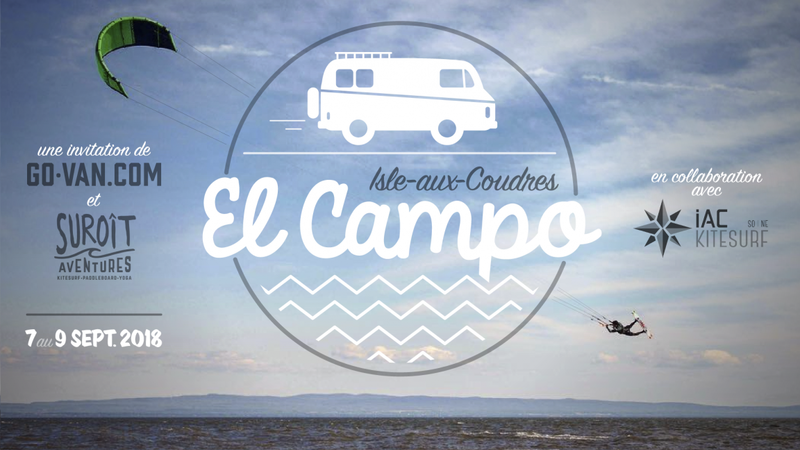 Van gatehring (max length: 22 feet except exception), kitesurf competition and music fesrival presented by Go-Van, Suroît Aventures and IAC Kitesurf on l'Isle-Aux-Coudres in Charlevoix. A campground will also be set up. It is impossible to sleep in your car on the site, you must have a tent or a van. L'Isle-Aux-Coudres is already well known to vanlifers from all over Quebec and it was natural for Go-Van to imagine an official gathering in this unique place! In collaboration with Suroît Aventures and Isle-Aux-Coudres Kitesurf, we will be entitled to the biggest kitesurf big air competition ever seen in Quebec. As if it were not enough, several local producers will be on site and you will be able to taste their delicious products. Friday: arrival of vans all day. Projections and music in the evening. Saturday: Animation and contest all day. Big air competition finals, live band (Fouki), DJs and campfires.